For years, the view of self has been restricted to our own human, eukaryotic cells, but recent research into the microbes that live in and on our bodies is dramatically changing this perspective. Findings from The Human Microbiome Project (2008-2013) have made it clear that 90% of the cells in the human body are microbial and that the genetic repertoire of these microbes is at least 150 times greater than that of our human cells (1,2,3). The fact that we are more microbe than man naturally has a significant impact on how we view human health, and research shows that the human microbiome – the aggregate of microorganisms living in and on the human body – could play a role in all sorts of different diseases and health ailments. Humans are very similar in terms of our human genome, but the microbial genome can be very different from one person to another. We also know that the microbiome can be altered fairly rapidly and that we therefore have the ability to manipulate our genome to an extent never previously thought possible. The fact that the microbiome is fairly sensitive to external input is also the reason why it has such an important role in health and disease. In a perfectly healthy individual, there’s a symbiotic relationship between the human host and the microbiome. We provide the bacterial communities with shelter and food, the microbiome provides us with metabolic functions that stretch far beyond the physiological capabilities of the human host, and everyone’s healthy and happy. However, antibiotics, western diets, and other factors associated with life in the modern world can perturb the microbiome and promote a state of dysbiosis. The balance between “good” and “bad” microbes in our body is now altered, and since we know that around 70% of our immune system is located in and around the gastrointestinal tract and that the bacteria in our gut profoundly shape our immunity, this dysbiotic state has a significant impact on our overall health (4,5). While researchers are still discovering new secrets of the microbiome, it’s already clear that dysbiosis plays a role in a lot of the chronic diseases and health disorders we see in the industrialized world, such as acne, colorectal cancer, diabetes, and irritable bowel syndrome (6,7,8,9). One topic that is often of special interest to those in the health and fitness community is weight loss. People try different “scientifically proven” diets and exercise regimes in the quest for a lean and healthy physique, but we’re now learning that a huge blind spot in the health and fitness community is the trillions of bugs that inhabit the human body and how they play an essential role in regulating host energy homeostasis. The microbes in our gut don’t provide us with a great immune system and various metabolic functions for free. To maintain a healthy symbiotic relationship we have to feed the metabolic powerhouse in our guts with fermentable food ingredients – prebiotics – that these microbes are able to utilize. The fact is that the human host only produces the needed enzymes to digest starch, monosaccharides, and some disaccharides, and that the rest of the carbohydrate we eat are either passed through undigested or broken down by bacteria in the colon. One of the problems with the typical western diet – with plenty of refined food high in fat and/or sugar – is that it’s primarily absorbed in the small intestine and contains little prebiotic fiber for our old friends in the colon. We’re virtually starving 90% of the cells in our body, and on top of that we’re probably changing the balance of bacteria in the upper gastrointestinal tract by eating massive amounts of refined carbohydrates and fats (10). There are now plenty of studies showing that the typical western diet – that is certainly without evolutionary precedent – alters the balance of microbes in the gut (11,12,13,14). It’s also been shown that a single high-fat meal, low in dietary fiber, can initiate endotoxemia in just a few hours, and that levels of C-reactive protein shoot up quickly after consuming a typical McDonald’s breakfast (15,16). When we lived as hunter-gatherers in the wild, this response to a high-fat meal would have benefitted us in the sense that low-grade inflammation initiated increased fat storage and therefore better survival when food was scarce. However, in the industrialized world we have virtually unlimited access to calories, and refined junk foods are especially cheap. This daily influx of hyper-palatable food certainly drives weight gain through several mechanisms, and changes to the gut microbiota and increased translocation of bacterial toxins seem to be very important in that regard. So, diet can change the composition of bacteria in our bodies. What else? We know that antibiotics dramatically alters the microbiome and that antibiotic exposure in early life is associated with consistent increases in body mass during the next years of life (17,18). Other factors that seem to play an important role are the increased rates of c-sections, bottle-feeding in infancy, reduced exposure to soil microbes, modern hygiene, and limited consumption of fermented food. Microorganisms are found in most parts of the human body, and each location has a unique composition of bacteria that are able to live in symbiotically with the human host in that specific environment. The large intestine is where most of the microbes live, and this collection of gut microbes – gut microbiota – is also the part of the microbiome that is most important in terms of weight regulation. In 2004, researchers at Washington University in St. Louis were some of the first to document a link between the gut microbiome and host energy homeostasis. They noticed that mice raised without a microbiome ñ germ-free mice ñ had 40% less total body fat than conventionally raised mice, while at the same time eating 29% more energy. Even more surprisingly; when these germ-free mice were colonized with normal microbiota, they experienced a 60% increase in body fat content within 14 days (3). It’s important to note that we can’t live without the microbiome and that the complete absence of microbes – as seen in this trial – is not something to aim for. Both studies in animals and humans show that obesity is characterized by an “obese microbiota” that is quite different than the microbiota of a lean person (19,20,21). Germ-free animals who are inoculated with microbiota from an obese person gain more weight than animals who receive microbiota from a lean person (22). Changes in the gut microbiota contribute to reduced host weight after gastric bypass surgery (23,24). Changes in the bacterial communities can cause weight gain (25,26,27). Transfer of intestinal microbiota from lean donors increases insulin sensitivity in individuals with metabolic syndrome (28). How can microbes affect whether we gain or lose weight? While most of the studies have focused on the gut microbiota in obesity, it’s apparent that the critters within play an essential role in weight regulation for everyone. But how is it that microorganisms are able to influence our body weight? Since we know that the microbiome constitutes most of our cells and DNA, and that the gut microbiota provides so many important metabolic functions in our body, it’s no surprise that disruption of healthy gut microbiota can promote weight gain through several different mechanisms. While a lot of the early animal studies focused on the role microbes play in energy harvesting, it’s now becoming clear that this enhanced energy extraction from food only is a small part of a much bigger picture. Chronic disease, weight gain, and obesity are multifactorial problems with no easy solutions. However, there are some conditions, like low-grade inflammation and oxidative stress, that seem to play an especially important role in the development and progression of many health disorders. Contrary to the acute inflammation that occurs when you sprain your ankle or get a wound, low-grade inflammation often goes unnoticed for a long time before symptoms of disease occur. The million dollar question is where this inflammation stems from and how we can prevent or treat disease by managing the inflammatory mileu in the body. As we’re now starting to unveil secrets of the microbiome and understand the connection between microbes and human health, a lot of researchers are starting to believe that the trillions of microbes in our body could be a key player in driving inflammation and disease. One of the characteristics of chronic low-grade inflammation is elevated levels of proinflammatory compounds in the blood, such as c-reactive protein (CRP) and lipopolysaccharide (LPS). LPS is a toxin found in the outer cell wall of gram negative bacteria, and seems to be especially important in terms of the chronic low-grade inflammation associated with weight gain and obesity. It’s been shown that the “obese microbiota” has an increased abundance of proinflammatory microorganisms that contain endotoxins like LPS, and that people who are overweight and obese have more lipopolysaccharide circulating in the blood, a state referred to as endotoxemia (29). It’s even been shown that just taking one endotoxin-producing bacterium isolated from a morbidly obese human’s gut induces obesity and insulin resistance in germ-free mice (30). When gut bacteria ferment prebiotic fiber in the colon, they provide the cells lining the colon – colonocytes – with short-chain fatty acids. The tight junctions lining the intestine depend on these fatty acids, such as butyrate and acetate, to function properly and prevent leakage of bacterial endotoxins such as LPS (31). So, we have established that obesity is characterized by changes to the bacterial communities in the intestine, and that people who are overweight and obese have elevated levels of proinflammatory compound such as LPS in their blood. These endotoxins immediately prompt an inflammatory response in the body by binding to toll-like receptor 4 at the surface of innate immune cells (32). 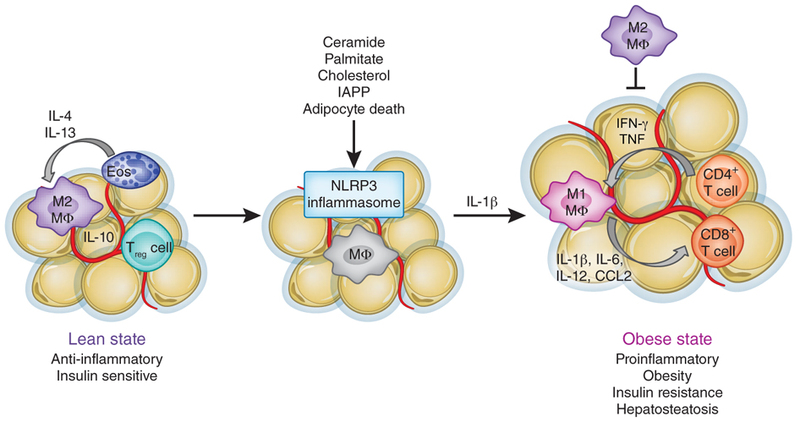 Since we know that fat tissue in itself can be proinflammatory, it was often believed that the chronic low-grade inflammation associated with obesity was solely a consequence, and not a cause, of weight gain. However, we now know that endotoxemia, and the subsequent inflammation, in itself can initiate weight gain, insulin resistance, obesity, diabetes, and other metabolic disturbances (33,34,35,36,37). It’s important to note that other mechanisms such as regulation of adipose tissue and liver fatty acid composition, and modulation of gut-derived peptide secretion also are important in terms of gut microbiota and weight regulation. The fact is that there is still a lot we don’t know about the trillions of bugs that inhabit the human body, and although it’s well established that the microbiome plays a role in overweight and obesity, the magnitude of its contribution is still unknown. As mentioned earlier, prebiotics are non-digestible food ingredients that stimulate the growth of beneficial bacteria in the digestive system. When we eat these types of fermentable substrates, our beneficial gut bugs get a chance to flourish, pathogens are suppressed due to lowering of the pH in the colon, and the production of short-chain fatty acids increases (38). Although only a few types of carbohydrates are officially classified as prebiotics, all of the non-starch polysaccharides found in food are broken down by gut bacteria and could have a prebiotic effect. Onions, leeks, and jerusalem artichoke are some of the vegetables that are rich in prebiotic inulin-type fructans. Resistant starch is another food ingredient that’s especially effective when it comes to increasing the production of short-chain fatty acids in the colon and enhancing the growth of beneficial bacteria (39). Resistant starch is essentially starch that resists digestion in the small intestine and passes into the colon where most of it’s broken down by gut bacteria. 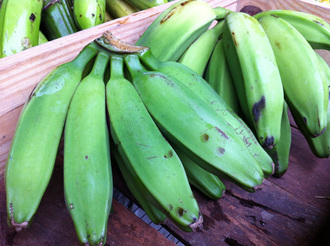 Good sources of resistant starch include green bananas, potato starch, legumes, and potatoes. The resistant starch content of foods like potatoes increase when they are cooked and then allowed to cool for several hours (retrograded starch). 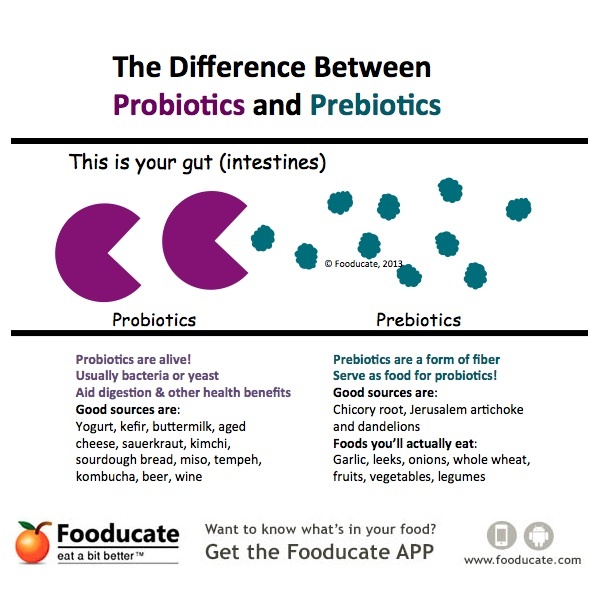 Probiotics are bacteria that have claimed health benefits when consumed. 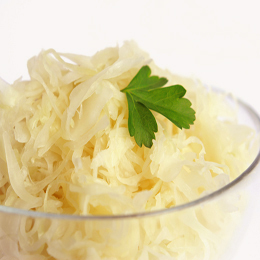 The two most well-studied types of probiotics are bifidobacteria and lactobacillus, which are commonly found in probiotic supplements and fermented foods such as sauerkraut, yogurt, and kefir. Just like with prebiotics, it’s likely that several species of microorganisms have a beneficial effect on human health even if they aren’t officially classified as probiotics. We know that humans have co-evolved for millions of years with the vast bacterial communities in soil, water, and other animals, and one of the costs of modern hygiene seems to be that we are losing touch with these microbial “old friends“ that helped shape our immune system. Can I lose weight by manipulating the gut microbiome? Fermented kimchi reduces body weight and improves metabolic parameters in overweight and obese patients (40). A recent review of 61 studies show that prebiotics and probiotics usually promote increases in bifidobacteria, weight loss, and enhancement of parameters related to obesity (41). Anti-obesity effects of gut microbiota are associated with lactic acid bacteria (42,43,44). Supplementing with prebiotics such as oligofructose has the potential to promote weight loss and improve glucose regulation in overweight adults (45,46,47). However, not all studies find an association between probiotic consumption and changes in body weight, and the primary problem seems to be that a lot of the clinical trials investigate the effects of a single probiotic supplement on inflammation, glucose tolerance, and weight loss. Since we know that the gut microbiota consists of hundreds of species of bacteria and that probiotics often lack the ability to colonize the gut, just ingesting a handful of species of lactic acid bacteria from a supplement will usually have little impact on body weight. We also know that only some species of bacteria seem to be effective and that a lot of the probiotic supplements on the market don’t contain the quantity of colony-forming units claimed on the label. This doesn’t mean that all probiotics are a waste of money, as some strains of probiotics have been shown to increase the number of beneficial bacteria in the gut and promote a more diverse microbiota (48,49). The same principles apply for the typical store-bought yogurt – It contains only a handful of species of bacteria that won’t have any long-lasting impact on the gut microbiota. The human microbiome is one of the hottest research subjects in the scientific community at the moment, and we’re slowly learning more and more about the complex interaction between microbes and the human host. This has also led to increased interest from the corporate health industry, and some companies have already begun financing the production of advanced “microbiome modulators“. It’s possible that we’ll soon see a whole new spectrum of probiotics and drugs that are directed at the trillions of microbes that inhabit the human body. Could the microbes that live in and on our bodies be one of the biggest blind spots in the history of medicine? Just taking a probiotic supplement or eating some yogurt from the supermarket will have little, if any, benefit. Rather it seems that a diet that contains nutrient-rich whole foods, prebiotic fiber such as resistant starch and oligofructose, and traditionally fermented foods such as sauerkraut, kimchi, and kefir is optimal for people who want a healthy and diverse gut microbiome. There are also several other factors besides diet that impact the microbiome, such as antibiotics, c-section vs. natural birth, and breastfeeding vs. bottle feeding. It also seems that modern hygiene often is to the detriment of our microbiome, and that triple-washing organic produce from the garden or farmer’s market probably isn’t a good idea if you want to increase bacterial diversity (50). The primary takeaway is that we have to stop looking at the human body as a single organism, and rather acknowledge that diet and lifestyle have to be tailored to a complex ecosystem made up of trillions of microbes living symbiotically with the human host. We also have to realize that the microbes that inhabit our body are passed on to the children we bring to life through birth, breastfeeding, and other types of close contact. It’s therefore highly likely that part of the genetic component of obesity and other health disorders has to do with transferring microbes and their DNA onto the child. It’s also important to note that although this article has focused on the role microbes play in overweight and obesity, we are now learning that the microbiome has an essential role in both our mental and physiological health, and it’s therefore no doubt that paying attention to the old friends that inhabit your body is important even if you are perfectly happy with your physical appearance. Going back to the quote from Albert Einstein, it’s clear that the expanding view on the human body is one that certainly leads to liberation from self. I try to eat sauerkraut with breakfast every day, and as I sit here reading this I’m sipping on some kombucha. 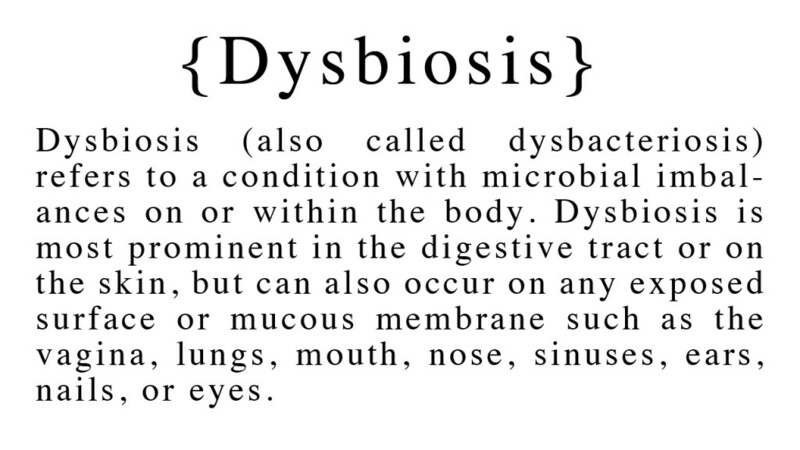 But I rarely give thought to the prebiotic, which seems to make quite the difference! Very interesting findings..
Bret, interesting article. I actually just made my first batch of sauerkraut at home. And I was interested in this exact topic, but I couldn’t find a good look at it, so thank you for writing it. In the end, it’s tasty, filling, and trivial to do so I’ll keep eating it and any health benefits are a bonus. Very interesting article! Thanks for this great summary! What the inulin in stevia? Bonafide prebiotic i.e. Sweet leaf? Interesting read. I’ve never given a lot of thought to the prebiotic discussion but I do know that most people have no idea just HOW much bacterium we really need to ingest. Most alternative health professionals (Mercola, Wallach, Fuchs) recommend 70-80 BILLION units a day. That’s a lot of micro-bugs! The probiotics industry is worth over $22 billion and has increased about 6% in the last year. The whole Activia marketing plan was so effective! But there is really very little evidence in humans that probiotic supplements affect metabolism. People seem to assume that it’s possible based on mouse studies with germ-free or gnotobiotic mice. In reality, the diet–not supplements–makes the biggest difference in colonization, which is why prebiotics (really a fancy name for fiber) appear far more effective. Probiotics were the ‘next big thing’…but it always comes back to a healthy, varied diet in the end. you can also take greens plus whole body nutrition. they have a fermented version that has a high level of fermented things i guess with high level of the healthy bacteria. its for optimal gut health and aids in digestion. i take it every morning. See http://www.huffingtonpost.co.uk/toni-harman/microbirth-babys-mircobiome_b_4947959.html for more info on how birth affects the human microbiome.